During this time of year I can be found in the hedgerows with a pair of scissors and a basket full of frothing clouds of white elderflowers. On a warm day, nothing is as refreshing as a cold glass of homemade elderflower cordial. Somehow the shop-bought varieties can’t quite compete, but the real stuff is the perfect drink: cooling, sweet, tart, syrupy, fragrant and filled with heady, floral, honey-like aromas. It’s the taste of summer. My love for elderflower goes back to helping my mother fill Mason and Cash with flower heads and steeping them in water and slices of citrus fruit. When I once enjoyed a glass of elderflower cordial on a hot day, I now am more likely to enjoy a glass of champagne with a splash of elderflower whatever the temperature. 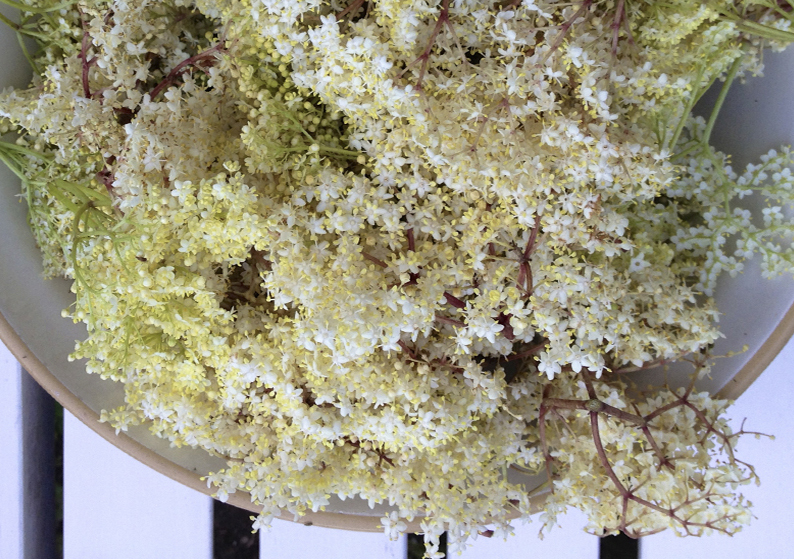 You can use elderflowers to make jam – with gooseberries or strawberries – or you can use it as a cooking ingredient; It works well in salad dressings, drizzled into cocktails or as a syrup for desserts or cakes. The best time to pick elderflowers is on a warm, sunny summer day, in the early afternoon when the blooms are fully open. Don’t pick if there has been recent rain, as lots of pollen gets washed away. Ensure you pick from a high bush, away from any roads, for the cleanest flowers. Cut whole heads off, using scissors at the base where the stalk begins to branch.